This week’s After Before was inspired by a tangent. I was looking through GIMP Magazine Issue 5 (I’m a bit behind on my reading as they are about to publish issue 12). I chose to read Issue 5 because Pat David was on the cover, and I have found his tutorials to be very helpful. So Pat David was being interviewed, and he was asked which tools he used the most in GIMP. He said, G’MIC Plug-in (which I have used in my tutorials), Curves, and Wavelet Decompose Plug-in. He said that he found Wavelet Decompose to be indispensable for editing portraits. I had to know more about this Wavelet Decompose Plug-in. Basically the Wavelet Decompose filter takes your image and breaks it down into several layers of different frequencies. What this allows you to do is make changes in the bigger details, like blemishes and frown lines, without losing the fine details, like pores on a face. Normally when you try to lessen blemishes or frown lines you end up with a too smooth result that looks fake. I followed along with the tutorial, then I went a few steps further and removed the small mole below her lip and changed her eye color – just to see if I could. The seed was planted. I wanted to try this plug-in on one of my own images. But I don’t take photos of people, so what image could I use? I decided to look for an image that had a distracting background to see if I could lessen the distraction. I chose an image of a pink pom-pom flower that I took back in Feb 2014. 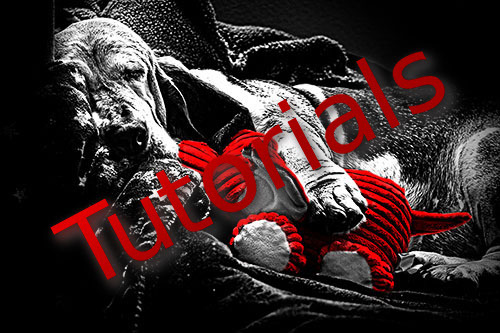 I’ve been trying to figure out how to write this tutorial in a way that isn’t super long. The main idea here is to use the Wavelet Decompose Plug-in to reduce the distraction of the background (texture and contrast). Most of the other things I did to the image I’ve done in previous tutorials, so I’ll see if I can just link to some of those to make this more manageable. I did my usual raw adjustments in UFRaw. Then I altered the image a bit with levels, curves, brightness-contrast, and color balance (I have plans to one day write up some tutorials that cover more basic features of GIMP, but I haven’t yet). Wavelet Decompose Plug-in. And changed the background color. Added a grey 70 layer. 1. I did my usual raw adjustments in UFRaw. 2. Then I altered the image a bit with levels, curves, brightness-contrast, and color balance (I have plans to one day write up some tutorials that cover more basic features of GIMP, but I haven't yet). This is the heart of this post, so I will spend more time in this section. The Wavelet Decompose Plug-in basically will take your image and separate it into several layers each with it’s own frequency level plus a residual layer (all the rest of the information from your photo, like color). 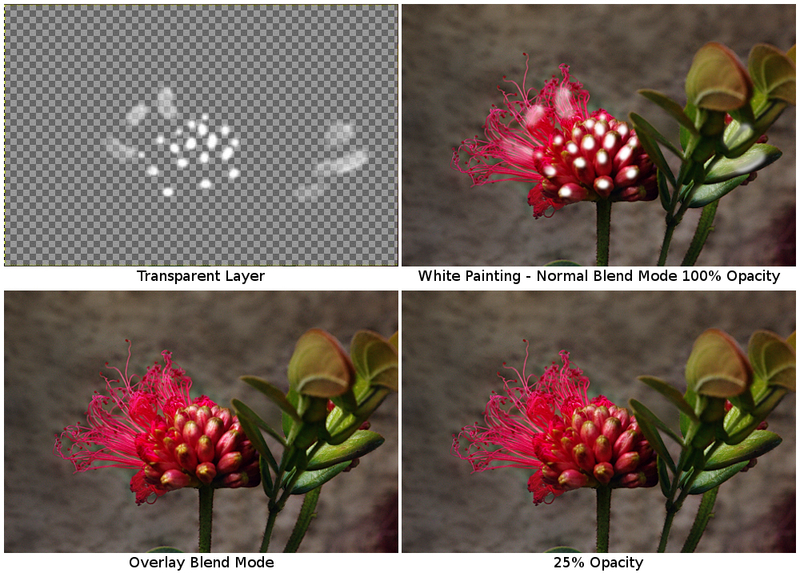 The details from fine to large get separated out into individual layers (each set to Grain Merge mode). This is important because you can blur, lessen, or remove portions of your image by playing around in the different levels of frequency. To remove details in one of the frequency levels you can either use 50% grey (128,128,128) or you can clone/heal areas. Let’s look at the breakdown of my image. I originally chose the default of 5 layers plus residual, but the texture on the wall was still prevalent in the residual layer. So I started over and created 8 layers plus a residual layer, it worked much better. Go to Filters->Generic->Wavelet Decompose (after you’ve installed the plug-in found here). 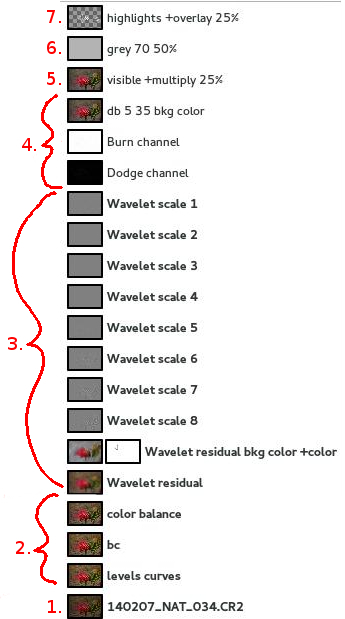 There is very fine detail in the wavelet scales 1-5 (we will leave these layers alone), and large details in wavelet scales 6-8… the large details are where we are going to do the most work. 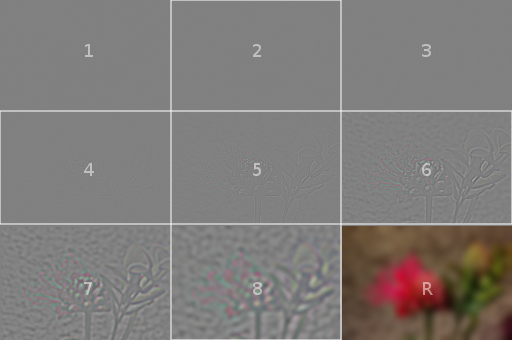 As you can see, in order to make changes to the texture of the background wavelet scales 7&8 are going to make the biggest differences. I could have stopped here. But I decided I wanted to try to see if I could make the background color more pleasing. I created a duplicate copy of the residual layer, changed the blend mode to Color. Next I took the color picker tool and sampled the dark brown area of the background. I made a transparent layer, filled that layer with the brown color, then inverted that layer to get a pretty light blue. I sampled the light blue and deleted the blue layer. (I cover this in more depth in my Split-Toning Tutorial). By selecting the inverse color of the background I will get a more neutral grey color when the two layers are blended together. 4. Ran a Dodge/Burn script. It’s a subtle edit. I ran the dodge/burn script [Script-Fu->Enhance->Dodge and Burn] at values Thin:5 Thick:35 (click to enlarge). 5. Added a Multiply layer. 6. Added a grey 70 layer. This entry was posted in ABFriday, gimp, operation badass, tutorial and tagged ABFriday, natural light photography, nature, nature photography, photography, post processing. Bookmark the permalink. Wow, super interesting post, Nic. I particulaly like how you applied a tool to something totally different than its usual use. I don’t use GIMP, but Ben’s comment that it is similar to Frequency Separation in Photoshop will give me a possible avenue to explore. I really like the final result. By the way, your Google search on the Henry George ad was a cool idea. It inspired me to look further and it seems those cigars were a big deal in the 1930s; they even had their own radio show. But I digress. I also wanted to say that the tutorial here was very impressive. Thanks, Robin! Yeah, frequency separation is a really awesome way to remove stuff without losing the details, I hope you check it out. Oh cool, I read that the Henry George Cigars Ad on that particular building was just recently revealed when they tore down the building next to a place called, Mom’s Cafe. On the wall of Mom’s Cafe they claim they’ve been there since 1929. 🙂 Yeah, apparently they were only 5 cents and were pretty good quality, made for the working man – which is why they used Henry George’s visage. At first Nic I was a bit lost (since I don’t use Gimp) but when mentioned the plugin using layers and then softening skin with out losing details I was following straight away. This is frequency separation, in photoshop and really useful then needing to fix colour or detail areas without affecting the other. Nice tutorial and an interesting read. Thanks, Ben! 😀 Yes it’s frequency separation. Correct me if I’m wrong, but I think in Photoshop you only get high frequency and low frequency. With the Wavelet Decompose Plug-in I can get as many levels of frequency as I’m willing to work with, which as I mentioned, I needed a few more levels than the default setting (5 +residual) because the contrast on that textured wall needed to be broken down into a few more frequency levels. Thanks, Katie! I really wanted the focus on the flower and that wall (background) is just so textured that it became distracting. So much better with the more subtle bg. And an interesting plug-in to look up. Thanks, Lynne! 🙂 It’s a really neat plug-in. I love how you thought outside the box and applied the plug-in to this photo. It makes a great difference, bringing in a lovely shallow DOF. Combined that with all the other tweaks you made and you ended up with a wonderful final image. Thanks, Nic, for taking the time to explain the process! I may have to give it a try. 🙂 Have a wonderful holiday weekend! No Problem, I hope it helps. 😀 Have a great weekend too! 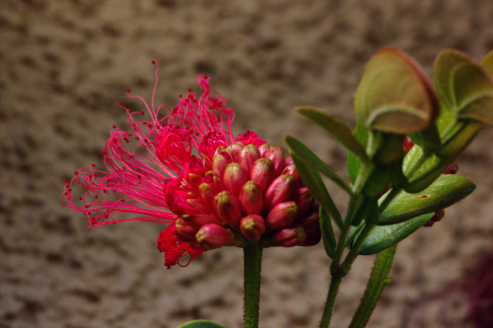 First, that is an awesome flower! I like how you softened everything to bring the detail in the flower out more. very nice.